President Franklin Roosevelt founded the forerunner of the March of Dimes, the National Foundation for Infantile Paralysis, in 1938, to raise money for research to find a cure for poliomyelitis, and to care for victims of the disease. Roosevelt himself was paralyzed after being stricken by "polio," also called infantile paralysis, in 1921. The NFIP itself was an expansion of Roosevelt's Warm Springs Foundation, which sponsored a rehabilitation center for polio victims in Warm Springs, Ga. In 1938, during a radio fund-raising campaign for the NFIP, the entertainer Eddie Cantor coined the term "The March of Dimes" as he urged listeners to contribute their spare change to defeat polio. The term, as Cantor used it, was a play on the popular newsreel series "The March of Time." The campaign against polio is one of the great medical success stories. The March of Dimes provided the money for the development of two effective vaccines, by Jonas Salk and Albert Sabin. Within little more than a decade, polio was reduced from one of the scourges of the 20th century to a footnote in the 21st. A global effort to eradicate polio altogether by the year 2000 fell short; the latest target date for eradication, in parts of Africa and Asia, is 2013. 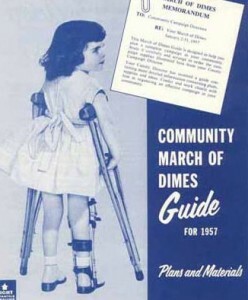 In 1958, with polio under control in the United States, the March of Dimes re-directed its efforts toward a new campaign, to eliminate birth defects. The following year, Dr. Virginia Apgar, who in 1953 had devised a scoring system for the well being of newborns, joined the organization that was then still headed by President Roosevelt's former law partner, Basil O'Connor. For the past half-century, the March of Dimes has been involved in virtually every effort undertaken to improve the health of babies in this country and, more recently, around the world. The March of Dimes supported research that showed that a pregnant woman's consumption of alcohol could cause birth defects, as well as the development of surfactant therapy for premature babies with respiratory distress, to name a couple.